How will Seahawks move on without injured star cornerback Richard Sherman? The Seahawks will now have to do something they haven't since early 2011 --- figure out how to play a game without Richard Sherman in the starting lineup. When the Seahawks get back to work next week coach Pete Carroll will begin devising something he hasn’t since early 2011 — a defensive gameplan without Richard Sherman. 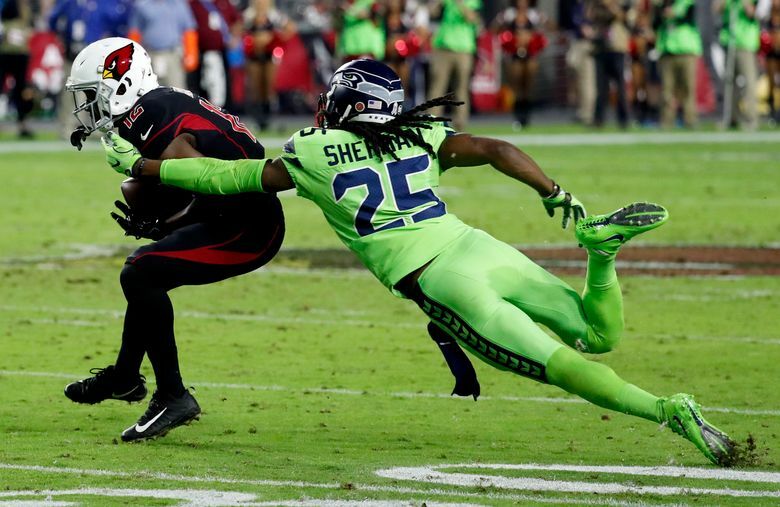 It’s a task that Carroll seemed unable to comprehend in the immediate aftermath of the loss of Sherman for the season in Thursday night’s 22-16 win at Arizona. How the Seahawks will replace Sherman appears pretty straight forward for now — Jeremy Lane will likely step back into the starting lineup alongside rookie Shaquill Griffin. Lane played the left cornerback spot that had been Sherman’s for the final 20 minutes of Thursday’s game with Griffin staying on the right side. Justin Coleman remained as the nickelback. Seattle has just one other cornerback on the roster, Neiko Thorpe. Seattle will undoubtedly have to add a cornerback to take Sherman’s place on the roster and a couple of options exist. Seattle has two cornerbacks on its practice squad in Akeem King, who saw action in five games for Atlanta in 2015, and rookie Mike Tyson, a sixth-round pick last spring. The Seahawks could also scour the free agent market and one intriguing name exists — Byron Maxwell — who played for Seattle from 2011-14 before departing in free agency and signing with Philadelphia and later being traded to Miami. Maxwell was released by Miami on Oct. 24 and could be signed for a pro-rated share of the veteran minimum the rest of the season (he got to keep all of his $8.5 million base salary with the Dolphins). Maxwell reportedly visited Atlanta earlier this week but did not sign with the Falcons. It would be little surprise if the Seahawks also bring in Maxwell for a visit. Seattle also could get back DeShawn Shead, who suffered a knee injury in the playoffs last January against Atlanta. Shead remains on the Physically Unable to Perform list. Seattle has until the end of week 11 of the season, or next week, to bring Shead back to practice. He then can practice for up to three weeks before the team would have to either put him on the 53-man roster or on Injured Reserve. Shead wouldn’t likely offer immediate help as he has yet to take part in a practice and would figure to need a few weeks of work before it would be realistic to think he could play — Carroll said last week he was not yet able to practice. But now with both Sherman’s injury and the window for Shead to return running out the Seahawks may place a little more urgency on seeing if Shead can make it back. With the trade deadline passed, though, the options are limited. Mostly, the Seahawks will have to rely on Lane and Griffin, with it obviously even more fortuitous now that Lane failed his physical with Houston two weeks ago and came back to Seattle after initially being included in the Duane Brown trade. Lane had been battling thigh and groin injuries but played 46 snaps in place of Sherman on Thursday. Griffin, a third-round pick last March, has started the last five games, moving into the lineup when Lane was injured and then staying in it with his emergence having compelled Seattle to originally include Lane in the Brown deal. But while the Seahawks can fill Sherman’s spot on the field, there will be no real way to replace his impact on and off of it. Sherman had started 99 straight regular season games since entering the lineup six games into his rookie season — his first start came against the Bengals on Oct. 30, 2011. It was the fourth-longest streak of active starts for any NFL cornerback and the longest current active streak for any Seahawk position player. And according to the analysts at Pro Football Focus there has simply been no better player at his position since then — according to PFF Sherman has a career passer rating allowed of 53.0, the best in the NFL in that span. He had allowed just one reception on four targets and 19 coverage snaps on Thursday before being injured with 5:30 to play in the third quarter. Sherman explained later that he has been battling a sore Achilles since the game against the Rams on Oct. 8 and almost seemed to consider the injury as inevitable. That led to the obvious question of whether Sherman should have taken some time to try to rest it. Sherman will now have surgery at some point in the coming days and then go about rehabbing. Assuming a normal recovery the expectation is that he would be ready for the 2018 season, which will also be the final year on his contract. Seattle has often signed what it considers its core players — such as Sherman — to extensions before entering the final year of their deals. But Sherman will also turn 30 in March and there had already been some conjecture about whether the team would be able to re-sign him given some of its other salary cap issues — Sherman has a cap hit next year of $13.2 million, though just $2 million is dead money. Those factors will undoubtedly lead to lots of speculation about Sherman’s future. That, though, is a matter for another day. How deeply the injury pained Sherman emotionally was evident during his meeting with the media after the game. He opened his press conference joking that the jacket he was wearing looked a lot better before the game when he hadn’t been hurt and using crutches. He ended it breaking into tears as he was asked how he can help keep the mood of the team up in the wake of a slew of injuries. And Sherman promised to do his part. He gave a vote of confidence for Lane, Griffin and Coleman and said he had no doubt they can carry on the tradition of the Legion of Boom.